All tanks carry an 8 year warranty. Water tanks have a specific gravity of 1. Check with the chemical supplier on the suitability of polyethylene for your application. 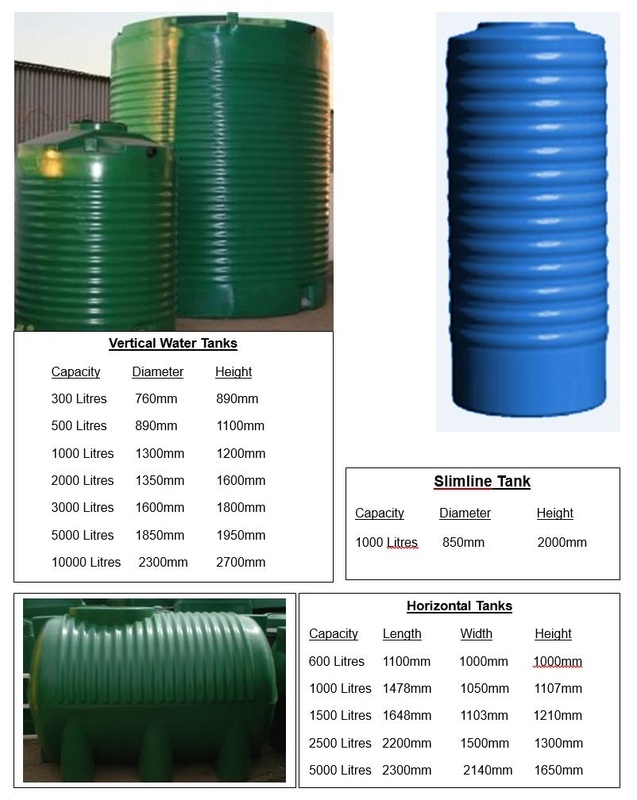 Tanks are available in a variety of colours – beige, brown, green, olive green, blue, white. The tank must be mounted on a level, firm base with no overhang and be strong enough to carry the weight of the tank when it is full of liquid. The tank must not be mounted on a sand or ground base. We recommend that the base be at least 100mm thick concrete, re-enforced with a medium mesh. If the tank is to be placed on a stand, then such stand must be strong enough to carry the weight of the tank when it is full of liquid. The base beams of the stand should be spaced no more than 25mm apart and must be strong enough to prevent the tank from bowing. Such beams should be treated for weathering. The tank must be adequately secured to the stand without distorting the tank. Fittings used on the tank should be of the same material. Pipes attached to the fittings must be firmly secured and not be allowed to hang on the tank.